In this year’s secondary school football competition, there are 17 schools participated with 64 teams. Every schools selected two or three teachers to look after their football teams and some of them they have never played football before. However, the Tonga Football Technical Director, Kilifi Uele planned to conduct a two days coaching workshop to all teachers who are in-charged of their football teams. ‘’When I received the request from the Secondary Schools Football Committee for a coaching course, I agreed and I started to work out the contents that perfectly fit their needs,’’ Uele said. ‘’A part from worked out the contents for the course, I seek the approval of the Principal Association, before I move further. When they approved, then I contacted to all the 17 schools participating in the competitions, and it was amazing the no of teachers show their interest and support,’’ Uele added. ‘’I must admit that I cut down the number of teachers from forty to twenty five to be realistic,’’ he said. Now we had twenty two participants and I’m so happy because this group of coaches were doing this course willingly and they are fully committed. ‘’The majority of the participants were never played football before now we complete the first day, everyone seems to learn a lot and they showed there interested, not only that they are all active during practical’’ says Uele. ‘’I will ensure there will be a continuation and also we will assisting teachers and this is the beginning of many coaching to conduct to teachers. I am glad this course is a part of our vision to popularize football here in Tonga,’’ Uele stressed out. During the closing of this coaching course, Mr. Simote Ongoloka, the chairman of the Secondary schools football committee representing the participants in making a thank you remarks. ‘’First of all, I would like to thank the Heavenly Father for his guidance and enable us to reach the conclusion of this course. Secondly, I wish to extend our sincere thanks and appreciation to Tonga Football for allowing this course to happen. I have heard of football many years back, and I now I learnt how to coach football, it’s a beautiful game indeed, and no wonder our School Principal supported our students to play football because it’s a great game to play! What we have learnt from this course we will do our best to pass it on to our students. Thank you Kilifi for the job well done, and please continue to do what you do best as we will continue to develop football, once again, thank you Tonga Football for everything,’’ Ongoloka says. 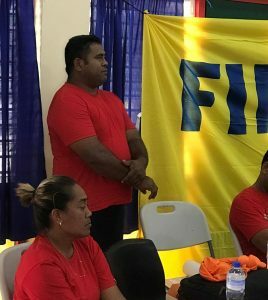 Tonga Football will conduct another refresher course before the conclusion of this competition while Moleni, TFA Youth officer will continue on follow up visit to schools that requested. There are few teachers participating in this course already indicate their interest to follow the coaching pathway and Uele will look up on few requirements that needs to be done! Previous Post Tupou College Under 20 team remain unbeatable!